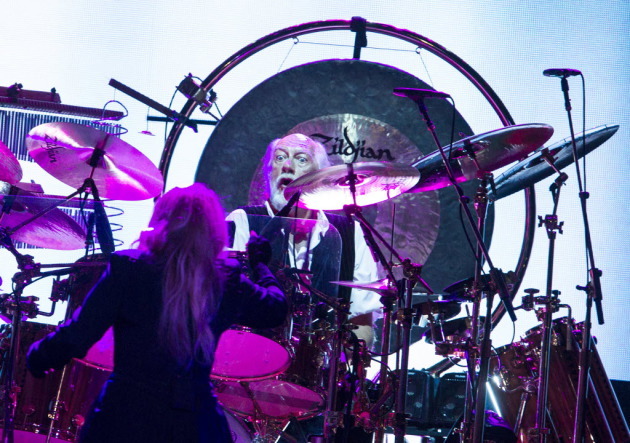 Drummer Mick Fleetwood acknowledged that he was feeling under the weather when he addressed the sell-out crowd Friday at the end of Fleetwood Mac’s concert at Xcel Energy Center. Indeed, we heard rumors that he was getting an IV and oxygen before the show. On Saturday in Lincoln, Neb., things didn’t go so well for Mr. Flu-wood. He began vomiting backstage. The show was curtailed by several songs, according to the Omaha World-Herald. “Mick is really sick. We don’t know exactly what to do,” Stevie Nicks said, adding that Fleetwood suddenly became ill and was throwing up backstage. Set to play more than two hours, Fleetwood Mac cut its set short by eight of its planned 24 songs and finished almost an hour early with “Go Your Own Way” and “Songbird,” and they had to call on a drum tech to get behind the kit to finish.